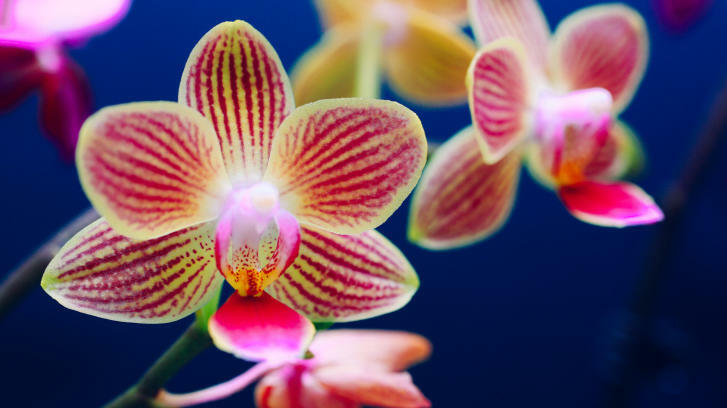 With flowers that look like butterflies and last for months at a time, Phalaelnopsis, or moth orchids, are a gorgeous indoor plants. Keep them happy and you’ll have blooms year after year. 1. Let there be (bright, indirect) light! An east-facing window that gets morning light is ideal. South- or west-facing windows work, too, but be sure your orchid is shielded from the brightest (and harshest) of afternoon sun with a sheer curtain. The leaves should be a bright shade of olive green. Darker leaves means the plant is not getting enough light; red-tinged leaves mean there’s too much exposure to light. Phalaelnopsis are happy in the same temps we are: above 60º at night and between 70º and 80º during the day. Remember: Temperatures on a windowsill are colder or hotter than the rest of your house, and fluctuating temperatures can cause buds to drop off right before they open (causing a huge bummer). Pay close attention that your Phalaelnopsis is out of the way of any drafts. When flowers fade, you have two choices: Cut the spike down to the leaves and the plant will grow a strong stem with even larger flowers within a year. Or you can cut stem just above the first node (it looks like a bump) below the lowest faded bloom. Often the remaining stem will produce another round of flowers within 8 to 12 weeks. A once-weekly lukewarm watering is usually enough for Phalaelnopsis. You might need to be a little more frequent in summer, and less so in winter. When in doubt, give it another day. With a narrow-nose watering can, irrigate just inside the pot rim, under the plant leaves. It’s key that the crown (the center of the plant) remains dry. Use a paper towel to blot any excess water to avoid crown rot. Make sure the pot has drainage and excess water can run out, and that the container doesn’t sit in a saucer full of water. Feed weekly with a light fertilizer (a teaspoon of 20-20-20 liquid fertilizer to a gallon of water—remember, I’m fine using fertilizers indoors). Once a month, skip the fertilizer and use clean water to flush any excess salts. No potting soil allowed! When bark chips have decayed (usually between 1 and 3 years), water your Phalaenopsis, jiggle it out of the pot, and wash the old bark from the roots, snipping off any dried or mushy roots with clean clippers. Repot in moistened, medium-grade bark so the base of the bottom leaves sits above the bark and 1/2 an inch below the pot rim.